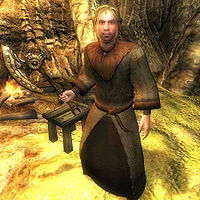 Traelius is a Breton who lives in the Subterrane area of Dire Warren. He spends all of his days sat on his wooden stool, perhaps longing for his lost wife, Alyssa. Traelius wears a tan robe and a pair of doeskin shoes. He carries a leveled blunt weapon. Besides these items and his journal, he carries leveled gold, gems, soul gems, potions and jewelry. Traelius has a Heretic birthsign which gives him a Fortify Magicka ability, a potent Dispel ability, and can cast major spells from the Alteration, Conjuration, and Restoration schools of magic, as well as major and minor spells from the Destruction school. 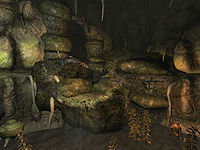 Traelius has hidden himself well; in order to reach him, go to the easternmost section of the Subterrane where there is a waterfall and a pool of water with several Red Kelp plants growing in it. Walk along the top left edge above the pool and jump on the various outcroppings, heading to the waterfall in the center. Having an Acrobatics skill of 50 or above is recommended. After moving through the small opening in the waterfall, take the first left over a few rocks, then the next right, and you will find the hermit and his camp. His journal tells the tale of his struggles with his love, Alyssa. Looking to get away from the "Inferiors" in the city, Traelius sought seclusion in Dire Warren. His wife became distraught over their new residence, and Traelius discovered that she no longer wanted to live there. Though saddened, he made no effort to stop her from leaving. He has since decided to remain in the Warren, despite being forlorn over his lover's absence. Alyssa never actually made it out of the Warren alive; her body, along with her journal and bow, Ly'ssane, is at the southernmost end of the stream that flows from the waterfall. The journal says that despite calling out to Traelius for three straight days after fracturing her leg near the waterfall, she received no response, and crawled as far as she could downstream. Successfully talking to Traelius will display the "I HAVE NO GREETING" dialogue bug. This page was last modified on 20 March 2015, at 00:46.